Forget New Year’s day, my resolutions usually follow my birthday. Take all that unconditional love, unfettered attention, add increasing age, propensity for senility and voila, you get a stupid New Year’s resolution that will last a day. If lucky. This year was all about the possibility of middle age spread. No matter that I am nowhere near middle age yet. Prevention is better than cure. So when a local mother declared she was doing the Autoimmune Paleo, I immediately paid attention. If you haven’t heard about the Paleo, you must be living in the dark ages or something. This, people, is the diet du jour. Basically, you eat what your cavemen ancestors did, pre-agriculture. (Paleo is short for Paleolithic – geddit?) If it wasn’t available through hunting, fishing and gathering back in the old days, it’s not worth eating. Except, I should have known this would never work for me. For a start, hunting, fishing and gathering already sounds like more physical labour than I have done in my entire life. Then there is the brain power needed to work out what entered our diets through agriculture. So sweet potato okay, not white potato? Hello migraine. And finally, I am Indian. I live on rice and lentils. It is the stuff my dreams are made of. Life without both? You cavemen have no idea what you were missing. Nonetheless, I embarked on the ancestral dietary pattern. Kale Omelette for breakfast. No drama. Mackerel and Avocado salad for office lunch. No big deal. Chocolates winking at me at tea time. Tempting. Then I came home to find a tall stack of warm Methi Theplas, freshly made by nanny K, on the kitchen worktop. End of. I have on good record that no one trusts a skinny cook. If evolution has taught me one thing, it’s to be sensible with portions. Dinner time meals, in particular, tend to be a one pot dish with protein and vegetables, served with a reasonable portion of carbs. Usually a fistful of steaming hot Basmati rice. Chicken curry, tends to feature a lot. This Andhra-style Methi Chicken curry, a Paleo-friendly Chicken Curry no less, combines sweet tangy tomatoes with the bitterness of healthy fenugreek, a match made in heaven. Fenugreek is available in abundance in Indian winters, and a staple ingredient when the temperatures dip. Imagine my delight when I found a frozen bag of chopped fenugreek in my local supermarket? That’ll be a last time I’m a Dodo about a diet. Chop the onion finely, and the tomatoes if using fresh. In a large pot, bring the oil to heat on medium. When it’s hot, toss in the cumin seeds and the curry leaves. As they sizzle up, mix in the onion and a pinch of salt. Saute for about five minute until the onions start taking colour. Next spoon in the ginger and garlic, and saute for another five minutes until the whole lot turns a darker golden. Then add the turmeric, chilli powder and saute for another five minutes to cook the spices. If the spices start getting stuck to the bottom of the pot, add a little bit of hot water and stir to release them. Now, stir in the tomatoes. I used a tin because I didn’t have fresh tomatoes handy, and I can safely say the result was delicious. But fresh would be great too, of course! Bring the tomatoes to boil, and then lower the heat to medium and cook until the masalas in the pot take on a jam-like texture. At this point, add the chicken pieces. Whack the heat up again and brown the chicken pieces, coating well with the masalas. Then add a cup of hot water, lower the flame to a medium and cook the chicken for about 20 minutes until cooked. The chicken will separate from the bone when the drumsticks are cooked. You can decide how much gravy you want in this curry. I kept a soft thick curry, to eat with rice. But if you want it more to go with rotis/parathas, keep the chicken cooking until the curry dries up. Finish by stirring in the fenugreek leaves, fresh coriander and garam masala. 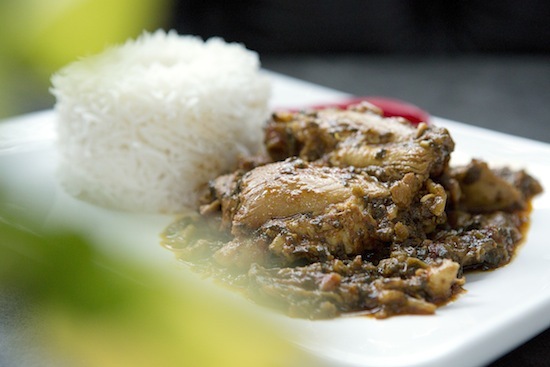 Simmer gently for five minutes, add salt to taste and enjoy the methi chicken curry with a side of rice. Paleo would be high-carb, isn’t it? Hi Ishita – it’s very low carb, although not no carb. Not for me, eek! 🙂 this one looks delicious perfect with some chapatis,. Thanks Notyet100, chappatis would be lovely. More than the chicken, I’m so drawn to that rice. It looks so … so … Japanese, if you know what I mean, its whiteness, the arrangement, it looks minimalistic. I love the simple technique you give for the recipe, so often I find Indian cooking unachievable because of the long list of ingredients and to-dos involved. I have all these things in the kitchen right now! Must try. Looks lush and lovely. Ah, the recipe looks very awesome. You have groomed it too well. I am not in a position to stop myself from cooking it now!! And the amazing part is the explanation of the complex recipe in a simpler manner in a minimum number of steps. You truly are a person with very good writing skills. Now that I want to try this recipe, I have ordered all the ingredients from http://qusec.in/ and will be preparing it very soon. Thanks for the simplified version of the recipe. so i tried this 2 days back for a special dinner at home. and the aroma and the gravy was just fab! i used thighs on the bone and when it was done it was a little too fiery for me so i added a dash of cream and it was divine! another hit from u. thanks! Hi Mallika 🙂 From one Bengali to another, from one Calcuttan to another, and from one diet-giver-upper to another: I’ve just spent a fine hour reading through your posts, chuckling at your stories. And I loved it. At what point do you add the methi? Sorry! did not realize that Fenugreek is Methi!! First time at your wonderful place, thanks for sharing healthy methi chiken recipe. One of the few websites, that has very detailed instructions. Really great recipes. I visited this website for the first time today. I have a couple of questions. Why do we have to add little salt after we put onion? Why is hot water required for cooking chicken? Don’t we have to fry methi leaves, wouldn’t it give a butter taste by adding it at the end? Love your website. Great recipes with detailed instructions. Very few sites will have so mic details. I have a couple of questions. How does it help in adding salt along with onion? Why do we have to add hot water to cook chicken? Why don’t we fry methi leaves? Will it not have bitter taste if we add in the end? Hi Yukthi, thanks so much and welcome here! 3. The bitter taste of the methi balances out with the tangy sweetness of the tomatoes. So in this recipe, no need to fry in advance. Thanks for your reply. I tried this recipe today and it tasted great with rice. Unlike other andhra recipes, this isn’t spicy. Why are curry leaves restricted to 10 only? I have a lot more recipes to try from this site, also I will have few more questions on other recipes. I was expecting notification through email once you reply. Is there any hard and fast rule in using the pots for different recipes? Thanks a lot for sharing this recipe. I did a quick search on net, all methi chicken recipes are not so easy to prepare. Hi Yukthi, so happy it came out well! You can definitely add more curry leaves if you fancy it. I try and be specific. The only hard and fast rule I use for pots and pans is to use non stick if you can. It dramatically cuts down cooking times. Last time I cooked methi chicken, it was a disaster and made me stick to butter chicken for a long time. But since then, I have kept my eyes open for a seemingly good recipe for methi chicken and this seems perfect. I am certainly going to try it once I get back to home. And yup, it’s better to keep the gravy thick. Tastes and looks much much better. Hi Mallika, thanks for the paleo recipe. I’ve been scouring the web looking for paleo curries. I am wondering, how much in quantity is a “tin” of tomatoes? I know you mean a can, but I’m in the US and all of our cans are measured in ounces or cups. I think most cans of diced tomatoes here are 14.5 ounces, but there are bigger and smaller. Can i reduce the quantity of chicken to 500 gms in this recipe, keeping the rest of the ingredients unchanged?